is the author of seven novels which take place during the American Civil War known as The Drieborg Chronicles. Duty and Honor is the first novel of The Drieborg Chronicles. Duty Accomplished is the second novel. In Honor Restored the character Michael returns to the life of a farmer. In the fourth novel, The Lincoln Assassination Michael Drieborg works with a team of marshals. The title 1860 America Moves Toward War explores the issues at stake in the 1860 elections. 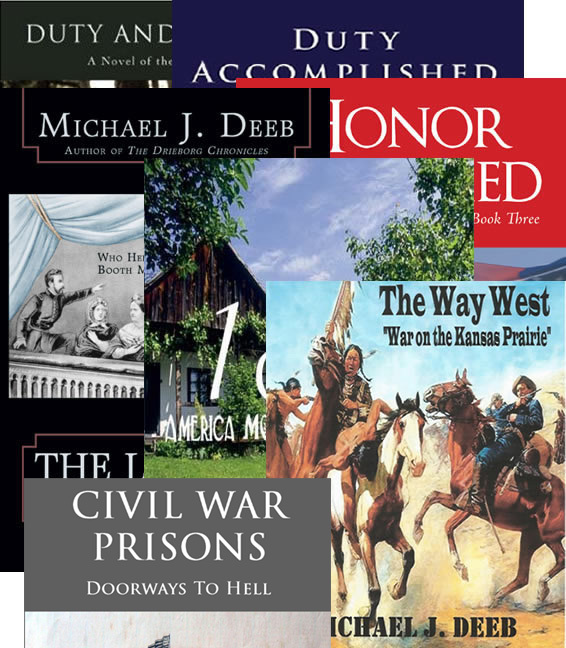 In The Way West, Michael Drieborg's youngest son runs away to join the US Cavalry in the West. Civil War Prisons follows the fate of both Union and Confederate captives and the quality of life they each endured during their confinement. Mike Deeb, with co-writer Robert Lockwood Mills, has also penned two novels which explore the Kennedy Assassination and attempts to answer the question, "Did Oswald Really Act Alone?" Learn more at thekennedymurder.com. Michael also blogs on the Website americacolonists.com, telling the stories of the freest people on earth. I couldn’t put this book down once I got started. The detail was great and I really like the main character, Michael. Knowing that so much research went into this book made it exciting to read! 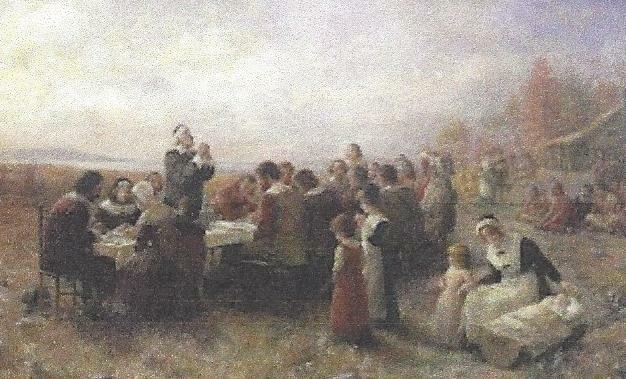 What was served at this first thanksgiving in the Plymouth Colony? As you read from Winslow’s quote, fowl and deer were served. It is reported by Sara Josepha Hale in the Goody’s Lady’s Book that turkey was the fowl served. In addition, fish, mussels and oysters, corn dishes,and breads were prepared for all the attendees. The custom continued in New England after the fall harvest but not in the rest of the country. The Continental Congress declared the first national Thanksgiving to be celebrated on December 8, 1777. In 1789, George Washington declared the fourth Thursday of November a day of thanksgiving and prayer. James Madison did likewise during his presidency. Few future presidents did this. But in 1845, Sarah Josepha Hale began campaigning for such an annual day of thanksgiving. Finally in 1863, (During the Civil War) Abraham Lincoln declared the last Thursday in November to be a national day of day of thanks, and a holiday. New York volunteers sent 400,000 pounds of turkey by ship to Grant’s army at City Point, VA for the observance of Thanksgiving in 1863. The observance of Thanksgiving continued to be celebrated on the last Thursday of November until President Roosevelt changed it to the fourth Thursday of November. It was codified into law in December 1941. It has remained a national legal holiday on the fourth Thursday of November ever since. The next blog will review the first major Union victory of the war. Do you remember it? It was during the winter of 1862. Was it in the East or the West? Tune in during December. Happy Thanksgiving all.